“Speak Up”…no really, speak up! This was my second year at the “Speak up with confidence”, hosted by Carol Kent, and it was amazing. Talk about a packed schedule. It is non-stop. And I love every minute of it...you go home tired, but it is good tired! It’s a time of non-stop opportunities to be poured into and to pour out into others. I can’t tell you how highly I would recommend this conference to anyone who desires or is currently writing and/or speaking in a ministry setting. “Speak Up” is a wonderful opportunity to learn, be challenged, be encouraged, equipped and spend time with other women (and a few men!) who love the Lord and ministering to others. As I listened, learned, watched and interacted…I was struck, again, by the truth in Ephesians 2:10, “For we are His workmanship, created in Christ Jesus for good works, which God prepared beforehand, that we should walk in them.” The corporate plural “we” are simply individual “you’s” in the singular workmanship. We are not many workmanship(s). We are just one. I just love "Lord of the Rings". Yeah, I'm a geek. I have two friends, dear sisters, traveling down roads they would rather not travel down. Yet, that is their road. Thankfully, they don't travel alone. Yes, the Lord will guide them...but they will also have a fellowship of sisters. Sisters who will walk with them, hold them up, fight alongside them, and remind them; when they can't remember themselves...that the leg of the road they are on, will come to an end. That He is there and His promises are true. 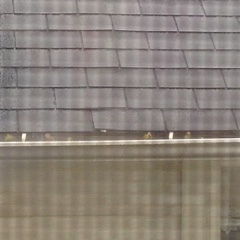 I noticed little trees growing in my neighbours gutters today. Actually, I'd hardly call them trees. Sprouts, are more like it, that are destined to die...but not before causing some real problems for my neighbor. It reminded me the importance of having seed planted in good soil and the necessity of roots growing deep. They reminded me of Psalm 1:2-3, "but his delight is in the law of the LORD, and in His law he meditates day and night. He will be like a tree firmly planted by streams of water, which yields it's fruit in its season and its leaves does not wither." These sprouts will never bear fruit...they will never produce what is intended. They will only cause stoppage and clogs in the gutter system. I wonder if a Christian without strong growing roots could do the same? Cause problems, stunt growth and cause clogs? It matters where we are planted and that our roots grow deep....are we like trees planted by steams of water or in gutters?
" Our Heavenly Father is still carrying out His purpose of making man in His image. Although His original purpose is the same, He is not using the original man to bring it about. All is now centered in the Last Adam, our Lord Jesus Christ." - Miles Stanford, The Green Letters. The Last Adam, Jesus. The Head of a whole new correct image bearing race....the Body of Christ, sealed by the Spirit. It's a profound thought, image, and mystery....nothing, absolutely nothing of the first creation- of the first Adams image will last. It's utterly and completely corrupted. Our flesh is sold, in every way, to sin....death....and destruction...and it must go. ( 1 Corinthians 15:36-50) Apart from Christ, there is no hope. The Life, death, burial and resurrection of the Last Adam, Jesus....by grace and faith in His finished word secures us into His new creation. We are strategically placed, woven with great intention and purpose into His singular masterpiece- the Church. Sealed and given everything for life and godliness....to be formed and transformed into the correct image of God, as our individual part of His Workmanship. Praise you Jesus!! Yes and Amen! "Setting my mind on the truth that Jesus is praying for me has changed the way I pray. I now pray with Jesus, not simply to Jesus. Jesus is interceding for me (and you) so I offer prayers for my family, friends, and myself with Jesus, to our heavenly Father." How is this possible that I can now pray with Christ, not simply to Him? Think on that, it's powerful! I'm not sure I've ever considered what a privilege and powerful thing it is to pray with Jesus...He is not praying with me, He is praying for me. Hebrews 7:25, "Therefore He is able also to save forever those who draw near to God through Him, since He always lives to make intercession for them." But as I learn to pray, I pray with Him. As my mind, heart, passions, desires, and kingdom heart-set is transformed my will aligns more, and more with His, I pray with Him....in accordance to His will. When I think of a "posture" of praying with Him I see alignment....coming together before the Father. I see community. I see unity. I see grace-filled beauty ,and magnificence. I see transformation. I see boldness. My eyes and faith are so small though, so as I learn to pray with Him according to His will...I am so thankful that the Spirit intercedes, transforms and translates for me. I can come boldly before the throne of Grace, in faith, knowing that it will be translated well....by the Spirit and Son. Romans 8:26-27, " In the same way the Spirit also helps our weakness; for we do not know how to pray as we should, but the Spirit Himself intercedes for us with groanings too deep for words; and He who searches the hearts knows what the mind of the Spirit is, because He intercedes for the saints according to the will of God." How do I learn this? How do I practice prayer? Does this have to be all complicated? And formulaic ? A system of prayer? No. I think it is very organic. Very relational. I'm not saying it should be disrespectful, impertinent , or too casual...yet prayer in Christ shouldn't be in whimpering fear. I'm learning to pray with Jesus.